This is a call to anyone interested in being involved with This proposed Zumba Event! 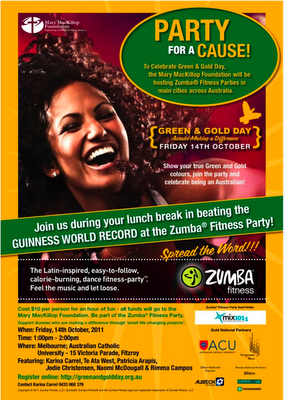 Seen here is an example of the Zumba poster and provision for sponsors. These events will be a series of 2 hour Zumbathons to raise funds for the Samoan NGO Women in Business that will use the funds to purchase a series of simple books that will enable them to communicate to the villagers why it is so important for them to return to their traditional organic farming methods. The book(s) will be translated into the 25 languages they represent over the islands of the Pacific region. They are educational eBooks currently available in English and Chinese (both simplified and traditional) and are for lay people plus children 5yrs and 10 yrs. The main Zumba instructor is West End star Laura Hamilton of Cats and Les Miserable fame and currently director and creator of the global educational training program Vocal Alchemy. To see if you are interested in being a sponsor please click on the links provided. The venue and date are soon to be advised.